The BBC Music Magazine is featuring Ondine's first CD release in partnership with The Philadelphia Orchestra as 'Disc of the Month' in January 2006 (ODE 1072-5). BBC Music Magazine critic Erik Levi labels the recording as "The Philadelphia's triumphal return". He points out that "after ten years in the recording wilderness, America's legendary orchestra is back in formidable form under its music director" Christoph Eschenbach who "brilliantly realises a powerful program". Concerning the quality of the recorded works, the reviewer resumes: "Its insight, brilliance and musicality makes this Bartók Concerto for Orchestra the top choice". The Philadelphia Orchestra's CD release also "marks a new era for US orchestras' recorded futures", in the words of James Jolly who selected it as one of the 'Editor's Choices' in Gramophone's January 2006 issue. Reviewer Rob Cowan noticed "a great orchestra sensitively conducted" by Christoph Eschenbach who "cues a light-textured, intense performance." He also refers to the luxurious packaging of "Ondine's beautifully presented CD". Soon after its release in November 2005, the disc instantly earned highest marks (10/10) for both Artistic Quality and Sound Quality from ClassicsToday.com. Reviewer David Hurwitz wrote: "This release represents a most auspicious beginning to the relationship between Philadelphia and Ondine. I'm pleased (...) to be able to recommend it to you in the strongest possible terms." It has been nearly ten years since The Philadelphia Orchestra made new recordings available on a regular and worldwide basis. Its recording partnership agreement with Ondine (which calls for a minimum of three recordings to be released per year) has attracted international media attention, including major articles throughout the international press (e.g. The Wall Street Journal, July 21, 2005; Gramophone, July 2005, pp. 10 and 18). The finest SACD recording technology highlights the unique spirit of live-performances of this legendary orchestra, as well as its world-renowned "Philadelphia Sound". All recordings are made under the direction of Christoph Eschenbach who has been The Philadelphia Orchestra's Music Director since 2003. It is the first time that both are making recordings together. 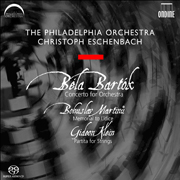 This first CD release combines a showpiece feature, Bartók's Concerto for Orchestra, with two relatively unknown masterpieces, Klein's Partita for Strings and Martinů's Memorial to Lidice. The recordings were made upon live-captured concerts that were highly acclaimed by The Philadelphia Inquirer (May 7, 2005). The release of this recording coincides with the sixtieth anniversary of the end of World War II. All three works presented on this disc were written by composers affected by the Nazi regime. Bartók wrote his Concerto for Orchestra (1943) during self-imposed US exile; Martinů composed Memorial to Lidice (1943) to honour the victims of the massacre of an entire village; the Partita for Strings, arranged in 1990 by the Czech composer Vojtech Saudek after the String Trio (1944), is Gideon Klein's last work which he completed shortly before he was transported to Auschwitz. The second CD release is planned for early 2006 and will comprise Tchaikovsky's Symphony No. 5, as well as six movements (January-June) from Tchaikovsky's piano work The Seasons - Christoph Eschenbach's first extensive solo piano recording in nearly 30 years.